Do you have a frost-covered pork chop, half of a Thanksgiving pie, or a frozen pizza from 2013 lurking in your freezer? I know sometimes I peer into the depths of my freezers and I am literally scared about what is in there that I haven't looked at in years! So this summer, one of my goals is to "summer cleanse" my freezer and force myself to dig through those frozen mystery items and reclaim the bottom drawer. And this summer Good Food Made Simple is helping me replace all of the expired and unknown items with healthy and convenient options that make nutritious eating in a pinch a breeze. 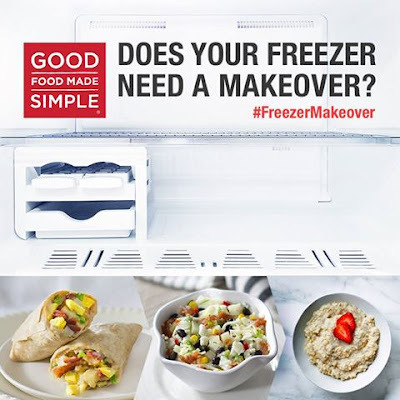 Good Food Made Simple offers delicious solutions for breakfast, lunch and dinner fresh from the freezer. My children are always begging for something fun for breakfast but during summer I am especially "lazy" and don't feel like spending hours on breakfast! So I grab for a Good Food Made Simple breakfast burrito and my children are happy and I am happy with what is going in my children! When I see an organic food that is high in nutrition, easy to make and can be kept in the freezer for the crazy days I don't feel like cooking, I am loading up my cart with these! And that is Good Food Made Simple's new organic entree burritos! Their burritos were always good but now that they are also organic, they may be our newest and favorite go-to easy dinner for the kids! A speedy meal needn’t skimp on quality or flavor. We love saying “Ole!” to heaven in a tortilla shell, the almighty burrito. These are flavored only with ingredients straight from the farm and ready in less than three minutes. We are in love. So this summer, join me in cleansing your freezer and start fresh with easy to make, easy to cook and delicious to eat meals from Good Food Made Simple! I know I will definitely have my freezer re-stocked in no time with their breakfast burritos and entree burritos! You can purchase Good Food Made Simple at your local grocer.